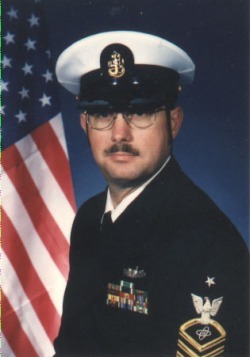 After 25 years, I retired from the US Navy in 1994 as a Senior Chief, and used my GI Bill to get a master’s degree in Environmental Science majoring in Nature Writing from Antioch University New England in Keene, New Hampshire. I edited “Heartbeat of New England” (2000 Tiger Moon Productions) and have over two hundred poems/prose poems published in such journals as Bitter Oleander, Sentence, Quick Fiction, Worchester Review, etc. and on line in such places as Contemporaryhaibunonline.com and BostonPoet.com. I recently signed a contract with Cyberwizard Productions ( http://cyberwizardproductions.com/) to publish my first novel, “The Healer” book one of the five book fantasy series, “The Silenian Wars.” Finishing Line Press, at http://www.finishinglinepress.com/index.htm has published a chapbook of my Japanese form titled, "Connections to This World." Having an environmental degree, I spend much of my time in the woods, alone and with my wife, Nancy. I also volunteer in Charlestown on the Conservation Commission, Tree Committee and as a Library Trustee. My early poems rotated around nature, but I shifted to surreal/fantasy and then into war poems when the latest Iraq War began, which makes sense as I am a veteren of both Vietnam and the first Gulf War. Now I write my nature poems as haibun, my surreal poems as prose poems and my war poems as free verse. I teach poetry at the Village Square Booksellers, Bellows Falls, VT.